Talk of a crisis in social care has been making headlines recently, as, faced by the dual pressures of austerity and an ageing population, social care services struggle to meet basic needs. The extent of the challenge is highlighted by a recent study in The Lancet, which predicts a significant growth in adults aged over 85 in the UK. In particular, it predicts a near-doubling of those in that age category with high dependency – meaning that they need help with basic aspects of their daily routine such as using the toilet or putting on shoes and socks. When projecting future social care needs, the critical information is not so much how many years someone will live, but rather for how many years they will require care, and what level of care. The study predicts that both the numbers of those aged 65+ in the UK population in the period 2015–35, and the numbers who have some level of dependency, and therefore require care, will increase. Amongst “young-old adults” (aged 65–74) the numbers with dependency are predicted to fall. This fits with UK labour market statistics which show that, in the past ten years, the number of people aged 65+ who continue to work has risen by more than 75%. The biggest challenge for health and social care services will be presented by the significant growth in the number of “very old adults” (85+), which will mean that the numbers of people in this group with low dependency (needing help with bathing or showering) will increase by an estimated 148%, and those with high dependency (needing help with meals, dressing and using the toilet) by 92%. One consequence of the growing population of elderly people is that the number of people living with multiple conditions will increase. Adults with some level of dependency and dementia will be more likely to have at least two other conditions – by 2035 this proportion is predicted to be 80%. This poses challenges for the care sector, as care workers in a particular facility, or on a particular home visit, will need the resources to deal with patients with an increasing range of conditions. The paper stresses that health and social care services will have to adapt in order to meet these “complex care needs”. Unlike health services, the current social care system is means-tested and locally-administered. Financial pressure on local authorities means that the eligibility criteria for publicly-funded social care are being unremittingly tightened. Over the five years to 2016, real-terms public spending on adult social care fell by £1.1 billion, despite a growth of almost a million in the population aged 65+. However, since the means test for social care includes wealth as well as income, lower rates of home-ownership amongst younger generations mean that in the future we can expect to see greater numbers qualifying for social care, which local authorities may increasingly struggle to provide. A less-discussed but crucial aspect of the UK social care system is the informal care sector – the unpaid family and friends who provide the majority of adult social care in the UK. Estimates of the value of this care range from £57 billion to over £100 billion per year. The “complex care needs” experienced by many of the growing population of over-85s may be a particular challenge for these informal carers. In addition, population ageing and a later retirement age mean that adult children may increasingly lack the time to help care for their elderly parents. The Lancet report predicts that more informal care is likely to be carried out by spouses. This will pose new challenges, as it means that, as the numbers of those with complex care needs increase, people may be ever more dependent on a spouse who is likewise elderly and possibly also in need of support. One of the greatest challenges is how to fund the growing need for social care for the elderly. 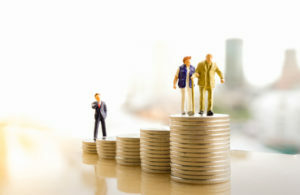 Increasing taxation on the working-age population is likely to prove unsustainable, as the number of working-age adults relative to the number of retirees will decrease as the population ages. The fairness of such a policy should also be questioned, given that the relative poverty risk for elderly people compared to the working-age population has dramatically reduced in recent decades. The economic condition of the elderly has been improved through targeted policies such as New Labour’s focus on pensioner poverty, and the Coalition government’s introduction of the triple-lock, which promised an annual state pension uprating of at least 2.5%. From both a sustainability and a fairness perspective, future sources of funding should not favour the old at the expense of younger generations. This is the argument behind calls, backed by experts from across the political spectrum, to introduce National Insurance payments for those who continue to work after the state retirement age. The growing numbers of over-65s who continue in employment are currently exempt from paying National Insurance Contributions. Research by IF has found that there are 1.2 million employed and self-employed people in the UK who continue to work beyond the state pension age, and, if they paid National Insurance along with the rest of the UK labour force, the government could raise at least an extra £1.5 billion, which could help cover the growing costs of social care. Such a proposal is likely to be only part of the solution. The challenges faced by the complex needs of the growing population of over-85s go beyond questions of funding to broader issues of the whole structure of the social care system, and the complex relationships between the health and social care services. Figures such as those recently published by The Lancet may be concerning in the scale of the problems they predict, but the hope is that they may also be part of the solution, if they can serve as a catalyst for a long-overdue policy response.